Good news Smart Bro Prepaid Subscribers! 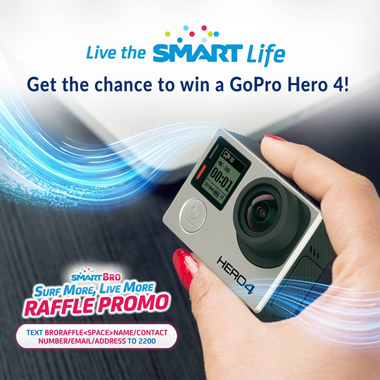 Here’s a better to live the ‪#‎SmartLife‬ by joining the Smart Bro Surf More Live More Raffle Promo, where you have a chance to win a GoPro Hero 4 and exciting prizes in monthly raffle draw. Plus, you could also Win a trip to Japan and a 2015 Ford EcoSport in the grand draw. Join now! Promo runs from June 30 to December 31, 2015. Promo is open to all SMART Bro Prepaid subscribers and Registration is FREE! 1. To Register, simply use your SMART BRO SIM and send BRORAFFLE<space>Complete Name/Contact Number/Email/Address and send to 2200. 2. To Earn Points, purchase and activate your newly-purchased Smart Bro Prepaid products; or you can just simply Top-Up any Smart Bro Prepaid package to earn an raffle entry points. Per DTI FTEB SPD Permit No. 7812 Series of 2015. Visit smrt.ph/brolivemore for more promo details. See UnliPromo and Smart Communications Facebook page for the latest news and updates.